Enable workspace switching using mouse scroll wheel. We’ve covered five ways to switch between workspaces in Ubuntu a few months back. Now we’ll have to make that six ways to switch now that Ubuntu Tweak has added a single-click solution to enabling “Workspace switching with mouse wheel”. Once enabled click on a blank part of the desktop and scroll up or down to roll on to the the left next workspace. Fed up of seeing your ‘username’ in the MeMenu? Help is at hand in this release; a new option, Me Menu Setting, gives the ability to swap between real name, user name or no-name at all in the MeMenu area. Lastly is the addition of a ‘system error’ helper that, rather than bleating on that something is amiss, actually offers up assistance in fixing the problem. 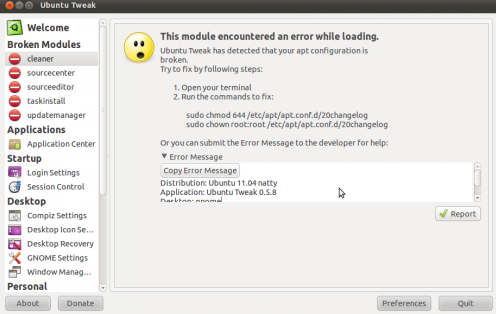 Ubuntu tweak 0.5.8 can be downloaded in this link.